Eleanor Bull graduated from the Theatre Design MA at Bristol Old Vic Theatre School in 2017. 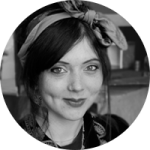 She has been working as a freelance Theatre Designer throughout the UK since graduating from her BA in Costume with Performance Design at the Arts University Bournemouth in 2013. Costume & Set Design for Crave (The Wardrobe, Bristol), The Witches (Theatre Royal Winchester), Much Ado About Nothing (Arts University Bournemouth). Costume Design for Julius Caesar (Bristol Old Vic Theatre- Main Stage), Othello (Riverside Studios), The Drowsy Chaperone (The LOST Theatre), Love and Money (The Tabard Theatre). Set Design for The Two Gentlemen of Verona (The Redgrave Theatre, Bristol).